I’ve covered several books by Canadian press QC Fiction over the past few years, and in this review I originally planned to take a look at their most recent release, Matthieu Poulin’s Explosions (translated by Aleshia Jensen). However, when another of their books arrived in the post recently, to be published on the 1st of November, I changed my mind. You see, as interesting as “a reimagining of Michael Bay as a cinematic genius” sounds, I’m more of a fan of pure literary fiction, and today’s choice is a short, heart-rending piece that lingers in the mind long after the last page is turned. 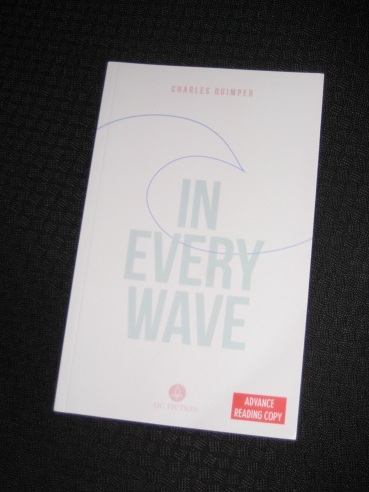 Charles Quimper’s In Every Wave (translated by Guil Lefebvre, review copy courtesy of the publisher) is a novella narrated by a man left distraught by the death of his young daughter. Her drowning has torn his life apart, and the book details his gradual breakdown, with his marriage (and house…) slowly disintegrating. As he thinks back to the fateful day, he wonders how he could have stopped the tragedy from happening, wishing he could find his daughter once more. And so that’s what he sets off to do. Having constructed a sea-faring vessel in his front garden, the man sets off in search of the daughter whose body was never found. His theory is that the water cycle means any drop of water could contain traces of the girl, and he’s determined to search the oceans until he finds her. It’s a sad story, and most readers will suspect (rightly) that it’s unlikely to have a happy ending. Let’s get this out of the way immediately: In Every Wave is an incredibly short book. Running to around seventy pages, with large type and generous spacing, this will be a one-sitting read for many readers, and I was done with the first run-through in under half an hour. QC Fiction pride themselves on doing things differently, and having this book appear in the same year as the gargantuan Songs for the Cold of Heart shows that’s no idle boast. If I had known you’d be with us for such a short time, I would have kept you awake every moment of it. I would have fought sleep with everything I had. If we had to sleep, it would be together in your little bed. I should have watched you when you jumped off the highest diving board at the swimming pool or when you went down the big slide at the park. If I’d known, I would really have watched, instead of pretending to, instead of chatting to someone about the weather. It’s this agony that underpins the work, a father wishing he could turn back time and spend more time with the girl he’s lost. After she’s gone, every drop of water reminds him of her, and he finds himself unable to go on, trapped in his house while hoping for more glimpses of her. At times, In Every Wave is a harsh, sobering account of the narrator’s collapse. While initially both he and his wife Marie drift numbly around the house, unable to even consider getting on with their lives, eventually their paths diverge, with Marie slowly pulling herself together. She gives into grief, and in this way begins to recover. He chooses denial, which simply puts him on a path to madness and self-destruction. In choosing to cling to the hope that his daughter never really died, the narrator sacrifices his marriage, and any semblance of an ordinary future life. This is also true when it comes to what actually happened. The text takes the form of a monologue directed towards his daughter, but even here we’re never sure about the truth, with several different versions of the fateful day given. There’s a sense that the guilt he feels is actually preventing him from revealing the truth, with his stories a defensive mechanism against the pain. Is he really on a ship? Did his house really spring a leak? It’s hard to say, and the end of the book brings no definitive answers. What can be said about In Every Wave, though, is that it’s a beautiful piece of writing, with Lefebvre creating a haunting English version. The poetic feel is enhanced by the short sections and the spaces between sentences, each appearing to fall heavily into the reader’s mind. In many ways, Quimper’s novella can be compared to another of the publisher’s releases, David Clerson’s Brothers (and not only for the nautical air), with its central theme of an odyssey brought on by the death of a loved one. The narrator here is hunting an elusive something that is actually inside him, and he won’t end his travels until the pain stops. You went under, and I’ve been at sea ever since, searching for you in every wave. Kaggsy – Not quite as devastating as something like ‘Beside the Sea’, but certainly a tear-jerker at times.